Time and time again I hear sad stories about dogs who cant stand being left alone at home and who give such major problems regarding this, that many even end up being returned to the breeder again. Their owners just give up in unhappy despair. This is such a shame. It is a perfectly natural thing for a dog to hate being left behind when it's "pack" leaves the home. So I would like to describe how I avoid this problem, it’s quite simple and has evolved over many years of dog ownership. Maybe others can be inspired and get some good ideas, I hope so. 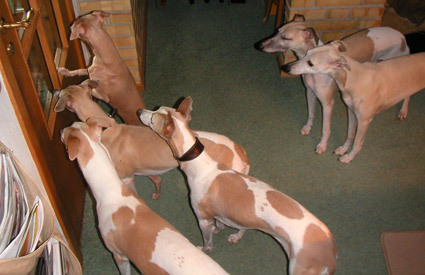 My husband and I have had up to 6 sighthounds at one time - all males. At present we have only two IG's. All dogshave slept quietly in our kitchen when we are out, (used to be the mud room, before we moved to where we are now,) and I have always carefully avoided any problems with leaving them alone based on the following do’s and don'ts. One should be clear right from the start, that it is a totally 100% UNnatural situation for a dog to be left alone by the rest of its pack, (the pack is YOU - the owner/family) whether the pack be humans or other dogs. In the wild, this would lead to a sure death - only dogs who live and hunt in packs together are successful and can survive. Animals left behind have little chance of survival. So it is absolutely against the dog's nature and inborn instincts when their family all dash off to work, shopping and school etc each morning and they are left behind, all alone with nothing to do for many hours. (Also, it is a form of severe punishment for a dog to be shut away. To be excluded from the rest of the group/pack is a stressful thing for a dog.) So it’s no wonder if it is extremely hard for a little puppy to endure our strange ways and busy lives and understand that being left behind is an necessary evil and no harm will come to it. However, dogs CAN get used to being left alone and when properly trained, this can become as natural to them as eating and drinking! IF you go about it the right way. Just remember though, that dogs are all different in their minds, outlook and temperament, so some may be slower to learn this unnatural thing than others. Some may give very little trouble at all and others might be a nightmare, taking a long time to get used to the situation - but persevere and don’t give up too easily! Patience will be rewarded! Many people get their dog in the summer holiday where they fuss over it 24 hours a day, then suddenly it is left all alone for many hours when the holiday is over - so no wonder half the house has been chewed up and destroyed in its panic, frustration, unhappiness and even terror at being left all alone. Add to this a large portion of utter boredom with nothing to do all day, right when the dog is young and very active! One should instead start training, (described below), after the first couple of days and the pup has settled in and possibly also combine it with having someone come in and feed/exercise the dog at mid-day for a while until the dog is adult and thoroughly used to the familys life-rhythm and way of doing things. Another thing: Puppies and young sighthounds are very active and need, not only for the brain to be occupied but also plenty of physical exercise. They need to run and play, discover the world about them, meet doggy playmates and different activities like training, agility or whatever you can join of different activities. Plus the fact you cannot escape: Puppies and young dogs urinate much more often than mature dogs, so they often cannot hold themselves for very long periods of time. This too has to be learnt - and comes with maturity. If they are shut away for too many hours at a time, its only to be expected that they give vent to their boredom by chewing and biting things or barking to pass the time and use up this excess of energy. They can suffer a lot from stress. If this is happening, its a sure sign you are neglecting your dogs needs and remember: Destruction in the home is actually YOUR fault, not the dogs! An extra excuse for the dog is, that from 4 to about 6 months of age, they are cutting their teeth and must have things to chew on! They get an uncontrollable urge to chew on almost anything and everything. Some damage to the home cannot be avoided. (Warn the children to take extra care of their toys, as these will most certainly be stolen and misused at every opportunity!) Make sure that there is plenty of the "right things" to chew always lying around and every time you discover the "wrong" thing being chewed, then shove the right chew bone straight into the dog’s mouth in exchange! After the changing of milk teeth excuse, destruction in the home can be a sign that the dog is not being active enough. A tired and satisfied dog is very well behaved! Or it is stressing up in it's terror of being left behind by the loved ones. A dog cannot "bring itself up" - the owner MUST take sufficient care of the training of it. All this takes time, especially in the two first years. Go to all the puppy training, obedience, agility etc that you possibly can. All dogs (and their owners!) derive great benefit from these activities, not least sighthounds. 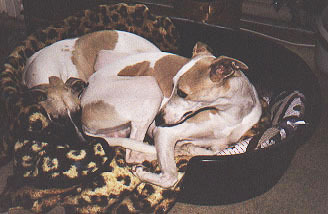 Sighthounds need to learn to mix with "ordinary" dogs! Also, a dog who has learnt a lot of different commands is a joy to its owners, who will be duly proud of it! The dog will be happier too. I recommend reading every book one can lay ones hands on, (and borrow from the library), about dog training and especially about dog psychology - you can never know too much!!! Read especially Jan Fennell's first book. If you havent the necessary time for all this, then you should rather have a cat! 2) Prepare the room the dog is to be left in. Dogs should not be allowed to have the run of the entire house. The home can easily become a chaotic playground, damage is almost inevitable and also accidents (of all kinds!) can happen - and will! The idea is, that the dog should learn to lie and sleep quietly so it hardly moves at all until you come home again. My dogs are so calm while we are gone that they dont even get up to drink water and often they are thirsty and drink after we arrive home again! They kind of "hibernate". The place you choose to shut the dog in, (preferably in the home and not in some far away barn or outhouse, as this too will distress a dog - to be shut away and unable to guard the loved one's premises and posessions), must be suitably warm especially for the shorthaired dog breeds. (My Whippets often lie with warm jackets on in winter, if I am in any doubt that the warm mud-room, just isnt quite cosy enough, as they like their backs to be warm. Cold draughts from the air-conditioning fans is not a good thing with thin skinned Greyhounds, Whippets or IG's! If they are lying cosy and warm, they are less likely to be restless, but instead more or less just hibernate for the duration! Make sure that the jacket is not tight or uncomfortable as many designs are no good for lying around in, being meant for a standing or walking dog figure! Remove all things from the floor like shoes, loose mats, wire cables etc or hanging items of clothing or even chairs etc. (wooden chair legs can be wonderful "bones"!) - remove anything which could be misused by the dog. Door handles which are pulled down to open can be repositioned upright, so there is no chance they can be opened by small paws jumping up and pulling down! And finally: Put plenty of dog toys on the floor especially chew things. (Although there mustnt be anything they might fight over, if several dogs.) For puppies and young dogs still learning, I have even put some tree branches on the floor. (Fairly fresh, not old and dried as these could give spiteful splinters.) These are very popular chews for those who might fancy a bit of destruction work whilst Im gone! The bits and pieces are easily vacuumed away afterwards. Create some set rituals and habits that you always go through every time regarding leaving the dogs. Always tell the dogs they are to STAY, so they know from the start and dont get worked up hoping they are going too. Get dressed and ready very quietly and sad, like you are going to a funeral, so they never get the idea youre going to have fun without them. Dogs are fantastically observant and notice tiny signals and clues even more than we are aware of. So we often dress in outer clothes and shoes to do one thing in and change everything in the garage afterwards, so the dogs cannot guess where we are going, as we do tend to have different clothes for certain doggy activities. Take them on a good walk or play in the garden, just make sure the dog is well exercised and minded for relaxing prior to leaving it alone. It is a good thing if the dog is already minded for a sleep and has "been to the bathroom" beforehand. Especially when you are practising leaving the dog, choose a moment when you know it needs a good sleep. In spite of exercise beforehand, we always put them all outside for a last chance to empty themselves an extra time just before we leave. Mine are trained to "go" on command - I am always with them to supervise and see there’s no cheating and they do not come inside again until I have seen "results" - so they learn very quickly what the command means! Male dogs have a tendency to save a drop to next time and it is good if they understand that this is their last chance for quite a few hours. One can never expect a dog to lie quietly and behave itself, if it is needing to go to the bathroom. The very last thing we do is throw a handful of puppy food all over the floor. Why puppy? This is because it consists of really small particles that are much harder to find! Dogs hate to actually watch you disappear - and we have a glass door - so we dash off whilst they are all frantically searching for the small pieces each one trying to get more than all the others. Then, when the new dog has settled in, (just a few days, if your time is limited), I start to teach it to bear that a door can be shut between us for a short while - for example when one goes to the bathroom, where it previously always followed with me. I always give a command like "wait a minute!" and I can if necessary speak through the closed door and to begin with it’s just for a few minutes at a time. Ignore the dog's warm greeting afterwards - this should appear a perfectly natural event so just keep on going past it with a brief "good dog!". This is the first small but important step to getting the dog used to being separated from me. I train with this often all day long so it is soon a natural thing that we are apart for a while - in just any room. At first I am only gone one minute or so - I make sure I am back before any whining or protesting starts. A closed door should not be the cause of a fit of anxiety or stress and also the dog is no longer quite so much "my little shadow". It should soon learn to wait patiently outside or even wonder off and play with no problems. After this, we train by leaving the dog in the planned room, my utility or some call it "mud room", or, since I have moved, my kitchen just for 5 - 10 minutes whilst we APPEAR to have gone out. We dress up in our coats, bags, hand bags etc exactly as we would if we genuinely were going out, either to work or the shops... but actually we stand outside and listen to hear if it cries. This is best when it is tired and ready for a sleep. If this goes well, we gradually increase the time alone at home, monitoring for any signs of whining, howling, barking or other unhappy activity. One must never proceed faster than the dog is perfectly relaxed about being left alone and accepts the situation. Any whining and protesting and one goes back a step or two in the procedure until the dog is fine about the situation again. When you "come home again" - because maybe you never went anywhere in the first place in the beginning of the training - refrain from too warm a greeting, just praise the dog calmly, lovingly and briefly, (and of course the dog should come straight outside on your homecoming in case it again needs to empty itself. Obviously it doesn't, after just 5 minutes or so, but this is all part of the "geniune look" (as far as the dog can detect) of "alone at home" practise! Try to create the atmosphere that you leaving for a minute or two - or longer is "no big deal". DO THIS MANY TIMES A DAY! I know it's a total bore, but by "leaving the dog alone" as many times as you can manage each day, 4 or 5 at least, will get the dog to the stage where it doesn't really care any more! This is your aim, to get the dog casual and blasé about you leaving. It "de-sensitizes" the dog so you leaving becomes a completely natural part of it's life. NB. If any damage has been done, do not ruin the happy homecoming with scolding or getting angry. This serves no useful purpose as the dog cannot understand what you mean and will become very nervous every homecoming, as it cannot know if you will be pleased to see it, (as it is indeed genuinely pleased to see you! ), or if you will suddenly get extremely angry "out of the blue" and all dogs hate their owners to be upset. They all only really want to please and be loved! Any accidents or destruction only shows that YOU made a mistake and must take better care next time and train at a slower pace. It is never the dog's fault - but a fault in your caring of it and training! The golden rule is do not proceed in the training faster than the dog is happy with. And if it protests, then go back to leaving it for as long time as it can bare OK and go on slowly from there. If every dog owner trained slowly AND OFTEN in this way, then Im sure they would end with their dream dog, as a sensible adult dog they can be truly proud of. For the rewards are great! 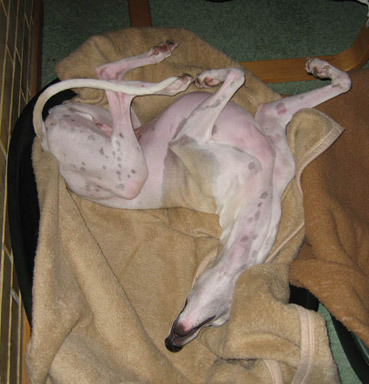 Photo: My Dee Jay demonstrating the ultimate in relaxing sleep positions!!! He is pink with warmth!